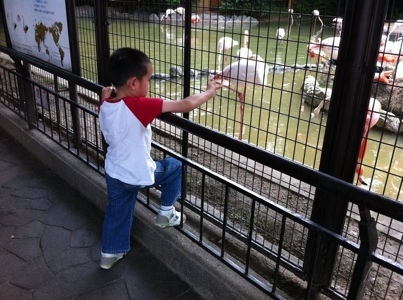 We went to Oji Zoo the other day. 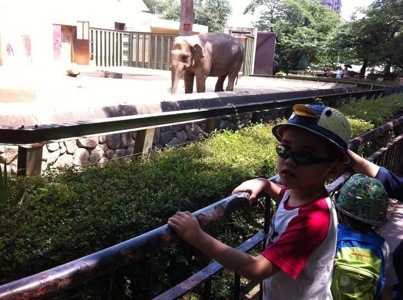 Nathan was very attentive and named the large animals. He couldn’t care less about the sleeping or camouflaged animals. But what was more amazing was how he got the whole theme park mapped out. 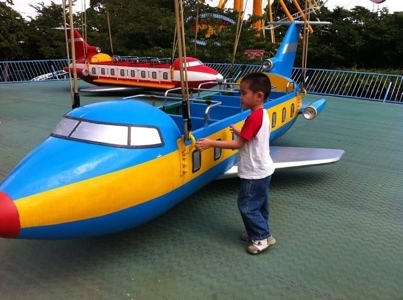 He knew exactly what ride he wanted and how to get there. 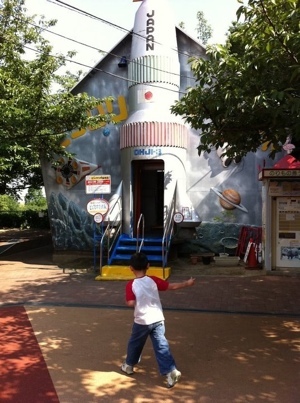 This space ship was the first he asked for and he walked right towards it. He did the same with he planes and train, despite so many other rides that were as noisy and distracting. Now, who said kids with cerebral palsy are bad on orienteering? So many mis-conceptions to straighten out. Nathan sometimes has echolalia or verbal “isms” – exclusive, repetitive behaviors. An example of which is saying “crystal” repetitively. B. Nathan can do better? If you chose “A”, you probably celebrate every attempt he makes and this will encourage him to try harder next time. If you chose “B”, do you recognize his hard work? or do you express your thoughts, almost saying “come on Nathan, you can do better!”? I would prefer saying: Nathan is trying his best…and we can help him do better. This video tries to express how Nathan might feel. In the first part, I play Nathan “isming” with the word “Crystal”. Kristine is asked to continue asking about what “Crystal” meant. She asks a series of simple questions, which to Nathan might feel like an interrogation. In the second half of the video, Kristine is asked to join Nathan the Son-Rise way by repeating the word “Crystal”. I then try to express how Nathan might feel when we join him. 2. It gives them control over the situation. Nathan can never predict what you will tell him or ask him. It could be frightening for him. Remember how you were in your worst subject then all of a sudden, the teacher calls on you? That’s how Nathan might feel. For him to feel that he can better control the conversation, he will stick to one word, “Crystal”. 3. It gives them a sense of comfort. If too many word are thrown at Nathan, it may become too overwhelming for him. As we have observed, he already needs a few extra seconds to process a question, what more a series of questions. The best way to relief the stress is to stick to one word, “crystal”. While echolalia is seen as a sign of autism, it could simply be a prolonged phase that autistic kids have to accomplish before reaching higher levels of speech. Most kids will go through a brief, almost unnoticeable, phase of echolalia, which is important for them to recognize then understand new words. For autistic children, this phase may take longer but this is not to say they cannot go beyond this stage. While Nathan is enjoying repeating words, this may be creating new pathways in his brain that will become the highway to higher levels of conversations later on. Bottom line: Celebrate his verbal “isms” by joining him. When he is ready, let’s challenge him to have conversations. This week wasn’t a good week in terms Nathan’s sleep pattern. His schedule has gone crazy and last night he woke up crying. Nathan is sleeping and pooping better! I guess a lot has to do with time and energy spent on our son-rise program. Nathan now enjoys standing on everything, chairs, tables, even the swivel chair. Since his balance is constantly being challenged, he has to put his whole body weight equally distributed on both feet for better stability. This is something his Physical Therapists (since he was 2 years old) have been asking him to do, or for me to help him keep his body weight on both legs to strengthen his muscles. He’s doing this on his own and correcting his body posture making his abdominal muscles to work just as hard. The stronger abdominal muscles must be the main reason why he has better bowel movements. I believe this is the main reason why he poops almost every day now compared to every 3 or 4 days. His pooping schedule has been good for the past week or two. I hope this is a permanent change. The only other contributing factor I can think about is that I moved his prune juice from after breakfast to after dinner. Nathan is also sleeping much better. Probably because son-rise takes up a lot of energy and he will get tired at the end of the day and sleep well through the night. When Nathan was a baby we thought “colic” was the explanation of his sleepless, crying nights. It stopped for a brief period. When he was 3 years old, I remember logging his crying nights. In a month he would average 15 nights of crying, sometimes more. That’s 50% of the time. No wonder I would get just as cranky. When we went to China for stem cell injections, I remember thinking, “If this will at least improve Nathan’s sleeping pattern, it will be a big improvement.” Crying, sleepless nights was reduced to about 25%. At age 4 1/2, we opted for anti-epilepsy medication due to his abnormal EEG, also in the hopes of alleviating his autism symptoms. His crying sleepless nights stopped. There were only occasional crying nights. Note: there were no other long-term improvements in terms of autism symptoms. Its been more than a year since medication started and I’ve been feeling maybe his medication dose does not match his body weight anymore. He hasn’t started crying (well, not frequently) but he was getting up in the middle of the night and staying up, singing, for hours and falling asleep when it would be time to get up already. Sometimes he’d be really groggy at school or I would just keep him home. In the end, we decided against increasing medication. When I get brave enough, we’ll work on tapering his medication. That’s his sleep history. But since this month, Nathan has been sleeping on time, no crying episodes, sleeping all through the night, and waking up in a good mood in the morning. I do hope, this trend continues. At the end of her session with Nathan, Marie, my Son-Rise volunteer, discussed some of the things that happened. Nathan would ask for a cracker, as she responded, she would ask how he would like it delivered, jumping or flying. Sometimes Nathan would reply “jumping”, sometimes “flying” and enjoy watching the piece of cracker arrive. Sometimes Marie asked, “Who is this cracker for?”. And Nathan would confidently say his name. As we discussed, we realized, “Oh my! Nathan has progressed from one loop conversations to two loop conversations!” Ask him once, he’ll answer, then ask him a second question, he can now answer again! We will build on this so that when a third question is asked, he will answer! Today, the forecast was rainy so I decided to make Nathan absent from school to avoid catching a cold. Good opportunity to spend some son-rise time with him too. In the morning, we spent 2 hours in the “son-rise” room. After lunch, we went off to sensory therapy. Then we “swam” in the tub at home. Then some lull time after dinner. I can see how much more permanent learning can be with son-rise program compared to other therapies. During the lull time, Nathan was still quite active for his standards. As his twin sister, Amor, cut through her art paper, Nathan turned around with an expression-full, “oh no! You broke the tape of Spa (Spa is his silly word for the month)”. Since Amor did not answer, he said it again. And yet again, with an even louder voice. He wouldn’t give up until I finally came in and repeated, “oh know….spa!” He stopped and started laughing. Nathan does not usually struggle to get anyone’s attention. He would normally give up as soon as he tries. So that was really amazing to watch. Later, he asked for more raisins. We had been eating raisins and learning to count with them in the morning. Then, he remembered something he used to do in speech therapy: along with raisins, “Mr. Su gave me Pretz,” he said. Yes, he has done it! Nathan has successfully told me something in the past tense. He is starting to tell me stories of his past! It starts with that very first sentence. I do hope more will come. Since he’s happier, he’s also been showing more energy to walk or move around. Recently, he has been struggling to free himself from his wheel chair and to walk around. Nathan was excited to see his ABA teacher. He got very excited when he saw the play room. He must have remembered how fun his previous session was. During the first 30 minutes of Nathan’s ABA therapy, he was asked to fix a puzzle, shoot shapes, pass a ball and sort “the same”. All in Nihongo. I haven’t been working a lot with puzzles with Nathan, but he was really doing good finding the right spot and manipulating the puzzle. Last time he would, grab teacher’s hand to help him or start getting frustrated when he couldn’t manipulate. Nathan enjoyed the second half of the therapy, which was free play. We had a trial music therapy today. Nathan loved it! He was happy the rest of the day until the last few minutes before he fell asleep. He was also talking more. Nathan just recovered from a bad week of colds and cough. He had to drink medicine morning, noon and night for the whole week. I felt that he was showing more autistic symptoms (inattentive, jerky movements with silly facial expressions-bringing his fingers closer to his eyes). It may be due to the medicine or simply not feeling well.